The Tag Cloud is the T-symbol with a cloud behind it. When selected, this arranges all the current keywords into one long paragraph, with bolded and larger words for the more popular choices. This arrangement also makes reading and locating tags quicker and easier than otherwise scrolling through the elongated Keyword Tag Hierarchy list. 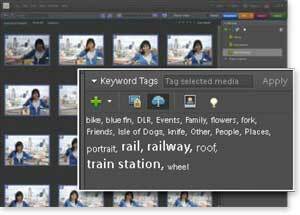 Selecting photos and dragging (but not clicking) the relevant keyword tag will also quick-apply to the selection.